Some of you may have seen this post on my Facebook page, but I thinks it’s important to get the facts out every way I can, so I’m sharing it here too. ​There has been a lot of talk lately about a lawsuit against dairy farmers and a rebate for anyone who bought milk anytime between 2003 and 2010 and lives in Arizona, California, the District of Columbia, Kansas, Massachusetts, Michigan, Missouri, Nebraska, Nevada, New Hampshire, Oregon, South Dakota, Tennessee, Vermont, West Virginia, or Wisconsin. Since I’ve seen a lot of confusion I thought I’d post a couple quick facts for you all. The lawsuit came about because several milk cooperatives came together and created a fund to buy dairy farmer’s herds. This was to help our industry as a whole better balance supply and demand. Farmers who were ready to retire from dairy farming could apply for the buyout and if they were accepted, the fund would pay for their cows and they could retire from dairy farming. Usually when a farmer retires from dairy farming, their cows are sold to other dairy farmers. However that doesn’t help reduce the amount of milk, so the cows from farms bought out by the fund were slaughtered for beef. The lawsuit against the dairy cooperatives was brought by an animal rights organization. They alleged that the cooperatives working together to establish this fund was equal to price fixing. I personally don’t believe the organization cared anything about price fixing and instead used this lawsuit as a way to try and hurt dairy farmers. Instead of going to court and spending loads and loads of money, the case was settled and a fund was established to pay customers who choose to file a claim. The amount of money dairy farmers have paid into the fund is already set. So more people applying to get a rebate won’t cost farmers more money, it will just result in the amount being divided into smaller amounts. You can apply for a rebate at boughtmilk.com by the 31st of January. My personal request is if you want to help support farmers in this, go ahead and apply for your rebate. When the check comes treat your family to ice cream or pizza with extra cheese with the money. Dairy farmers appreciate your support! « The 2016 Farmer’s Christmas Gift Guide! 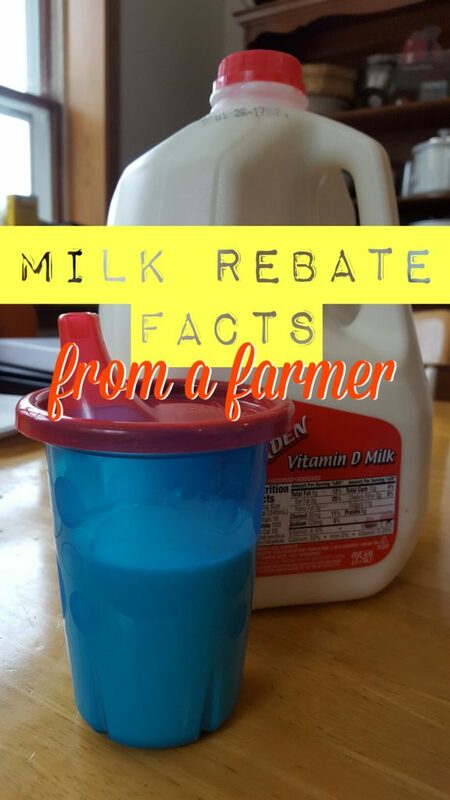 2 Comments on Milk Rebate Check Facts. When do the checks get sent out?